There are seven Walter Pidgeons seated in a waiting room measuring twenty-two feet by twenty-two feet. 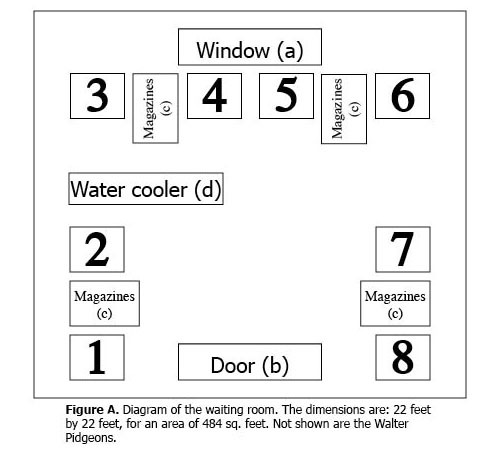 A picture window (a) takes up most of the wall opposite the door (b). The door, serving as entrance to the waiting room and as exit to the examination rooms, fulfills all of the functions of the “office,” as the sole means for patients to be seen and the doctor(s) to see them. Four groups of chairs (numbered 1–8) paired around four knee-high, magazine-laden tables (c) make up the bulk of the room’s contents. Above a water cooler (d), there is a shelf, painted a dirty off-white to blend with the walls, which holds a bowl of peanuts and a stack of small waxed paper cups with a floral design for the water cooler. Letters in parentheses refer to Figure A, at right. Not shown in this drawing are the Walter Pidgeons, whose total bulk narrowly exceeds that of the room’s furnishings. This diagram is not drawn to scale, and should only be referred to when considering the position of Walter Pidgeons in relation to each other. The particular seating arrangement of the seven Walter Pidgeons is liable to change. If, at a particular moment, a particular Walter Pidgeon is sitting in a particular chair—chair 1 for example—this is no guarantee that, having seen the doctor and been returned to the waiting room, he will return to chair 1, though, as the “pigeonhole” principle demonstrates, if he is readmitted after only one other Walter Pidgeon has been seen, he must return to that chair, as the only chair then available. Given the variance in examination schedules, there must be a corresponding variance in seating arrangements. There being no variance in the arrangement of the chairs themselves, their numbering will remain consistent. Each Walter Pidgeon sits in one particular chair and cannot sit in more than one chair at any given moment. Nor can two Walter Pidgeons share one chair. However, it is possible, even likely, that over time a given Walter Pidgeon may have been seated in each and every chair in the room, even that every Walter Pidgeon has been seated in every chair. The formula P(n,r)=n!/(n-r)! where n is the number of chairs and r is the number of seated Walter Pidgeons, will give the exact number of arrangements that must have been tried to obtain the result that a particular Walter Pidgeon has sat in every one of the eight chairs. It would not be possible to speak of a Walter Pidgeon who has not been seated in any one of the eight chairs, if it is the Walter Pidgeons seated in the waiting room that are at issue. The enumeration of differences and thus the nomination, denomination, and identification of each Walter Pidgeon is more challenging than for most groups of persons. Of course, if called upon to do so, any one of the Walter Pidgeons might catalog the ways in which he is himself, that is, not some other Walter Pidgeon. To date, none has been called upon to do so. Because of the nominal equivalency, the Walter Pidgeons, if expressed as a set of characteristics, ideas, histories, etc., may be seen to share an indistinct, gray area. 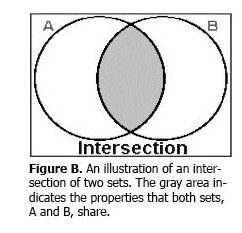 Figure B indicates this indistinct, gray area by the shaded, gray area, which is the intersection of the two sets. The outer, unshaded portion of each circle represents that portion of the set of characteristics that serves to differentiate each from the others. As large as these areas are, one should note the extent of the shaded area, an area thus both nominal and considerable. When the nurse enters the room to call Walter Pidgeon back to the examination rooms, she is unwittingly entering this gray area as well. However, not being named Walter Pidgeon, she passes as easily out of the gray area as the room. A flap of the hand is sufficient to call the specific Walter Pidgeon back and to disentangle herself from possible misunderstanding and confusion. In order to maintain the number of Walter Pidgeons seated in the waiting room, another Walter Pidgeon must have entered and occupied the lone empty seat. Because there is only a single door into the waiting room, it is impossible to say where he has come from, whether from outside or from one of the examination rooms. It is possible to conjecture that he entered in the time between the nurse’s entrance and her subsequent exit, as it was not likely during (the doorway is not wide enough to accommodate two people passing shoulder-to-shoulder), or after (as this would make it possible that the same Walter Pidgeon just departed had subsequently returned, invalidating the modifier “another,” previously used). Of the existence of Walter Pidgeons outside of the waiting room, some inferences may be made. Though one has exited, there is no assurance that that Walter Pidgeon still exists outside the room. By the reflexive principle, there is equally no assurance that the recently arrived Walter Pidgeon had an existence prior to entering the waiting room, despite the fact that this would seem a necessary precondition. It is nevertheless presumption. All that can be said with any certainty is that this room may contain all of the Walter Pidgeons that now exist. For the Walter Pidgeons seated in the waiting room, existence is mostly without incident. There is little of interest aside from the magazines on the tables at their sides, and after a certain amount of perusal, they too lose their interest. The Walter Pidgeons in the waiting room remain silent for the most part. Their noises include the shuffling of breath and magazine, the twitching of movement, and the infrequent cough and throat-clearing. The monotony is desperate, violent. In trials, the discovery of a deck of cards is cause for some excitement. Stakes are necessarily high, involving as they do the only possible currency as well as the only available nourishment—water cooler cups and peanuts from the refreshment table (see Figure A). The relatively huge winnings of the first games being soon devoured, the last pots are so paltry that in other circumstances the concentration attendant might have seemed ridiculous. When all of the peanuts and water have been disposed of, the cards are carefully sorted, piled, and returned to their case. With nothing left to play for, a gun is produced, and the pile of Walter Pidgeons grows, one by one, until all of the shots have been fired. The nurse having entered to call the next Walter Pidgeon, a Walter Pidgeon must have entered the room immediately before, vacating a spot in the examination rooms beyond the door, thereby producing the nurse’s response. The Walter Pidgeon that has just entered the room, provoking the “call-to-examination” response in the nurse, must be the Walter Pidgeon now called for examination, as the only Walter Pidgeon now in the waiting room. With the population-crash of waiting room Walter Pidgeons (Graph 1, at right), the number of Walter Pidgeons in the waiting room has dropped to one, and the system has entered a feedback loop. The loop itself might be best thought of as a Möebius strip (as shown in Figure C), where one might imagine Walter Pidgeon following the line of entering waiting room, called for examination, examination, entering waiting room, etc., that goes from one “side” of the strip to the other. In truth, the strip has only one “side,” just as the system of the clinic now has only one outcome for this particular Walter Pidgeon. Depending on the number of Walter Pidgeons already assigned to examination rooms, it is possible that the nurse will call a different Walter Pidgeon back each time she enters; however, there will never be more than one Walter Pidgeon in the waiting room in this type of system. One exception: a “hiccup” in the nurse-response could potentially introduce a second waiting-room Walter Pidgeon from the examination rooms, thus extending the length of the feedback loop by adding one agent. If a number of such “hiccups” should occur in sequence, variance, and thus stasis, could be restored to the system. Much more likely, however, is the eventual extinction of the remaining agents through behavioral invariance and starvation or thirst. Looking back at the formula given to determine the number of seating arrangements needed to obtain the result that each of the seven Walter Pidgeons then in the waiting room has sat in each of the eight available chairs, it is easy to see that, with the introduction of new agents, that is, the entrance of another Walter Pidgeon which occurs prior to the nurse’s entrance, the number of seating arrangements increases exponentially the longer the system is allowed to run, making possible an infinite number of discrete events given a fairly limited number of agents. Likewise, if the number of Walter Pidgeons in the waiting room is kept static through introduction and reintroduction, the system can be prolonged without producing the same event twice, thereby reducing stress on the individual agents. Only the extinction of agents during the run of the system can put an end to the system itself, by decreasing the number of Walter Pidgeons in the waiting room, thereby increasing the invariance of the arrangements, reaching the limit of the system, and closing the loop. Extraordinary measures, outside the scope of the system’s normal course, must then be taken if the system is to survive. One such measure, described above, is the alteration or temporary cessation of the nurse-response in situations of depopulation. This represents a more or less organic malformation of the system, as opposed to more drastic solutions which may require that the system be altered in fundamental ways: the wholesale return of Walter Pidgeons from examination rooms, or introduction of Walter Pidgeons from outside without activating the nurse-response, either of which might have the insalubrious effect of overpopulation and merely be a different path to the same cataclysm. The proper balance of nutrition, behavioral and situational variance, and time spent in the waiting room is thus essential to the success of this system. This variance, however, leaves room for no assurance that this result will not again obtain, even if meticulous preparation is undertaken.